Dr. Himmelfarb, MD, is Professor of Medicine, Director of the Kidney Research Institute, and holds the Joseph W. Eschbach, MD, Endowed Chair in Kidney Research at the University of Washington School of Medicine. For three decades he’s been a leader in clinical and translational research focused on kidney disease, and has authored 200+ peer-reviewed publications. In the late seventies and eighties one of the most exciting basketball teams was the Jerry Tarkanian-led UNLV Runnin’ Rebels. They only joined division I basketball in 1970 but just 7 years later they made the Final Four. In 1987, the Rebels again reached the Final Four, this time with only a single loss. They won the tournament over Duke in 1990. Since then, things have been a bit thin with probation and suspensions and string of less successful (and iconic) coaches. The Rebels have managed only one trip to the Sweet Sixteen since 1991. Kt/V urea is the UNLV Runnin’ Rebels. For fifty years dialysis has been saving and improving the lives of people with kidney failure. 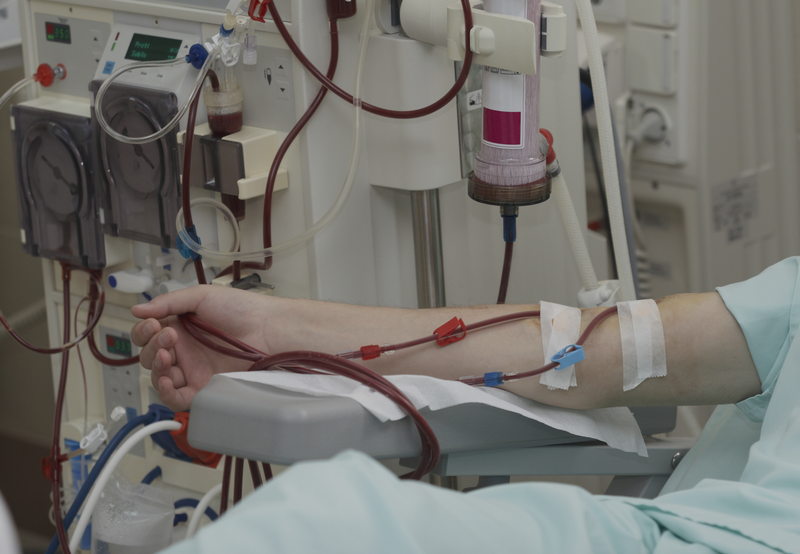 Without dialysis, ESKD is universally fatal. In ESKD the kidneys are unable to excrete the waste products of metabolism so they accumulate and cause uremia. Dialysis removes these waste products, or solutes, to maintain equilibrium between their generation and removal. The dose of dialysis is a measure of how much solute to remove so that patients maintain solute equilibrium. This showed that low BUN was important, with a less clear signal for time. A secondary end point was observed versus expected time to first hospitalization. Lower BUNs were clearly more important here, with P<0.0001. Time was NS with possibly the most significant non-significant P value ever at 0.06. With the introduction of Kt/Vurea, adequacy of dialysis was no longer assessed by a single static pre-dialysis value, of which the low concentration could be due to negative confounders such as low protein intake for urea or low muscle mass for creatinine. Kt/Vurea instead is a dynamic parameter that assesses removal by dialysis as a whole (Kt), including not only clearance but also dialysis length and above all a correction for body mass (V). Gotch and Sargent’s newly minted Kt/V showed that levels less than 0.8 were clearly associated with harm. Additional observational data was used and a target for Kt/V became 1.2. Even with the newly standardized dose of dialysis, outcomes were still unacceptable and doctors logically looked to higher doses of dialysis to improve outcomes. This theory was tested in three landmark randomized controlled trials in nephrology: HEMO, ADEMEX, and ATN. In all three studies, increasing the dose of dialysis, as measured by Kt/V urea, did not improve outcome. So that leads to the question of what’s next? Is there a better way to measure dialysis that could guide us to more effective dialysis and better outcomes for our patients? The list of substances that accumulate – “uremic toxins/solutes” – keeps growing every year. In a recent review Neirynck, Vanholder, and others identified several uremic toxins – limiting themselves to the ones that have a known adverse effect on the cardiac function. This review is notable because it included toxins produced by gut bacteria and also alternative methods of clearing these toxins including dialytic manipulations, prescriptions, dietary changes, and alterations to gut microbiota. A database of uremic toxins is available online. Small Solutes – Water soluble, with an arbitrary upper limit of 500 Da. They are easy to remove by any dialysis strategy – urea is the prototype of this class. Larger Middle Molecules (> 500 Da) – These are removed only by high-flux membranes – Beta-2 microglobulin is typical of this class. Protein-bound molecules (< 500 Da) – Smaller molecules but bound to proteins and difficult to remove. The most extensively studied markers in this class are indoxyl sulfate and p-cresol conjugates. Small Solute Clearance – Similar to Urea but different. It was not until a value in excess of 300 mg/dl of urea (BUN of 140 mg/dL) was obtained that vomiting became a constant feature. Headaches usually occurred as well. Bleeding from cannula site, nasal and oral mucosa, and subcutaneous tissue occurred within a week of urea loading. Values in excess of 400 mg/dl (BUN 187 mg/dL) produced malaise and lethargy, but no somnolence, mental slowing, or depression. So it is clear that urea causes uremic symptoms but it was only at levels far in excess of what we see today. However there is some animal research showing the urea levels encountered in dialysis can increase free radical production and insulin resistance. Other small molecules such as the guanidines are known to be have both neuro- and cardiotoxicity. The volume of distribution of guanidines is larger than urea, limiting their dialytic removal. Meyer et al examined stored samples from the HEMO study to identify the relationship between higher urea clearance and removal of non-urea small solutes. This study showed that there was a 9% increase in urea clearance between groups, and the change in levels of non-urea small solutes ranged from no change (p-cresol, ADMA) to significant reductions (trimethylamine oxide, indoxyl sulfate, and methylguanidine.) All-cause mortality did not relate to the levels of any of the solutes. The authors concluded that the clearance of urea did not represent the clearance of uremic toxins. The most effective way to increase the removal of guanidines is to increase duration of dialysis. Other molecules with smaller volumes of distribution, like guanidosuccinic acid, require more frequent dialysis. A combination of longer and more frequent dialysis is the best way to increase guanidine’s clearance. In conclusion, Kt/V urea is not a marker for non-urea uremic solutes. There are several solutes that behave quite differently than urea and one size fits all (Kt/V urea > 1.2 per session) is too simplistic to measure dialysis adequacy. We have not yet identified a single marker of adequacy and it is unrealistic to expect a single molecule clearance to represent the vast diversity of the uremic milieu. Depression is the most common psychiatric illness in patients on dialysis. Compared to the general population depression is much more prevalent in dialysis: up to a fifth of dialysis patients have depression (Palmer et al). The prevalence is higher in females than males (Kimmel et al). The 3-point field goal came to college basketball in 1980 and by 1987 it was a part of the Big Dance. But despite that early entry, its role was underappreciated for decades. It wasn’t until after the turn of the century that the 3-point field goal became the weapon that it is today. If you look at the 10 players with the most 3-pointers, 9 of them played after 2000. It was always there but for some reason we have only really incorporated it recently. Depression in dialysis has always been there but similarly we have only just become aware of it. Depressed mood or a loss of interest or pleasure in daily activities for more than two weeks. Mood represents a change from the person’s baseline. Impaired function: social, occupational, educational. The gold standard is the Structured Clinical Interview for DSM disorders (SCID), preferably administered by an experienced psychiatrist. Adapted from Hedayati SS, Yalamanchili V, Finkelstein FO. Kidney international. 2012;81(3):247–255. Despite those statistics, a recently completed RCT on depression therapy enrolled patients by screening them with the BDI followed by a psychiatrist evaluation and found the specificity to be less than 60%. Depression can diminish every aspect of patients’ lives. Depression can lead to functional impairment, strained relations, and difficulties with adherence to medication, diet, and dialysis plans. And most concerning it can lead to self harm and suicide. In an observational study it was shown that the probability of hospitalization was 12% higher in dialysis patients who were depressed as compared to those who were not. Depressed dialysis patients also remained hospitalized longer (Lacson et al). In addition, the presence of depressive symptoms is strongly linked to mortality (HR, 1.51; 95% CI, 1.35-1.69) based on 12 studies as published in a meta-analysis by Farrokhi et al. Most of the data used to generate treatment decisions in depression in ESKD comes from observational studies. RCTs in this area are sparse. One of the few RCT is the recently completed Sertraline versus Placebo in Patients with Major Depressive Disorder Undergoing Hemodialysis trial. 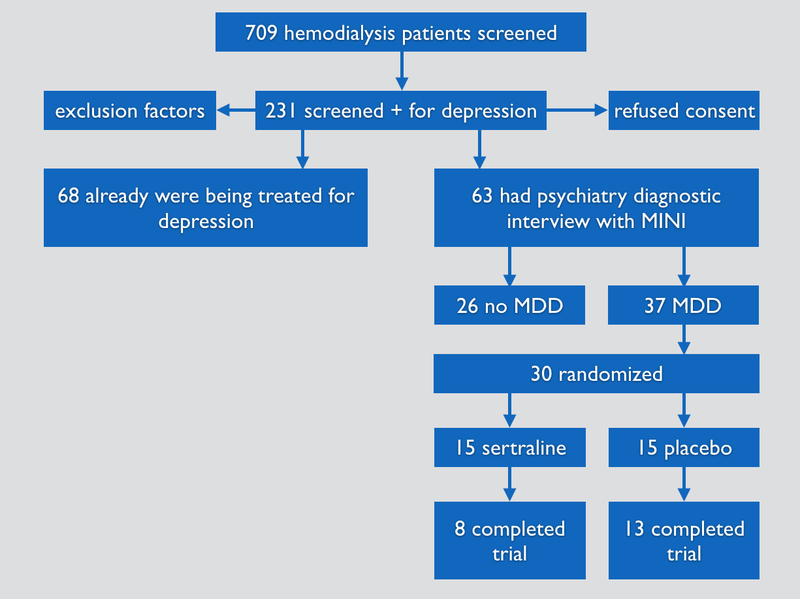 This was the largest randomized controlled trial of antidepressant medication in dialysis patients ever. It screened over 700 patients and had only 21 complete 6 months of therapy. Let me repeat that, the largest randomized controlled trial of antidepressant medication in dialysis patients had only 21 patients complete 6 months of therapy. The study did not show any benefit of sertraline as compared to placebo, but the authors are the first to recognize that their results may not be representative. Nearly a third of patients who tested positive for depression were already on an antidepressant medication. Additionally patients on placebo had a brisk and steady recovery throughout the study period (P<0.001). One of the more effective therapies for depression is Cognitive Behavioural Therapy (CBT). In a study from Brazil, use of CBT over 9 months improved BDI scores from 25 to 11 in the treatment group versus 25 to 18 in the control group. But the questions remain, including where and when to administer it. Bedside CBT during dialysis sessions is being explored. Pharmacotherapy is easy to administer, but drug interactions and adverse effects in the setting of ESKD are not predictable. It is not clear what works, what does not work, and what causes harm. The ASCEND Trial (A Trial of Sertraline vs. Cognitive Behavioral Therapy for ESKD Patients with Depression), a multicenter RCT, will hopefully be able to provide answers. And who were not on anti-depression therapy, 91% rejected suggestions to initiate medication or go for a psychiatric evaluation. Who were already on therapy, 73% refused to intensify the therapy by changing dose, changing drugs, or psychiatric evaluation. In the minority of cases where patients wanted and accepted additional therapy, the physician would often block therapy. In 61% of the recommendations the provider did not accept the recommendation to increase the dose, change the drug, or refer to a psychiatrist. FREEDOM study of patients undergoing daily dialysis on the NxStage system where the BDI scores improved from baseline values of 11.2±0.8 to 7.4±0.6 at 4 months, and this improvement was sustained at 12 months. The study was limited by a large dropout rate (of 239 participants, 111 discontinued for various reasons, most commonly being a modality switch or return to in-center dialysis). 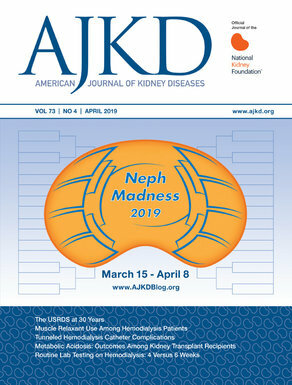 Figure 1 from Jaber et al, AJKD, © National Kidney Foundation. Effect of daily HD on BDI score at 4 and 12 months in participants with baseline moderate to severe depressive symptoms (BDI score >15). P < 0.001 for both intention-to-treat and per-protocol subcohorts using repeated-measures analysis of variance for testing time effect. Error bars represent the 95% confidence interval. In the FHN trial there was improvement in the RAND-36 physical-health composite score of 3.4±0.8 in the frequent dialysis group; the corresponding change in patients in the conventional-HD group was 0.2±0.8 (P=0.004). Exercise therapy – A few studies (Johansen et al, Kouidi et al) demonstrated improvement in depressive symptoms and scores with exercise therapy. Many depressive symptoms are worsened around an acute medical or social event, so maybe the correct answer is to “ride it out” without changing the mental health regimen but perhaps patients would really benefit from intervention at those moments. With so little prospective research it is hard to know the right answer. The conclusion is that we do not have a conclusion. We do not know how many of our patients are depressed. We do not know how badly it affects their quality of life, adherence, and outcomes. We do not know how ESKD and depression affects the caregiver and the family dynamic. As always the last line in papers is – more RCTs needed – but as demonstrated by Friedli et al – it is not always easy. Doctors have recognized that kidney failure causes cognitive impairment over the last 150 years. Though we don’t see the severe impairment described by Dr. Addison due to modern renal replacement therapies, that doesn’t mean our patients are spared this complication. With increasing emphasis on incorporating patients’ desires and wishes into the medical plan it is now more important than ever to recognize the problem of cognitive impairment in CKD and dialysis. How can we have meaningful conversation about conservative care if the patient does not have the cognitive function to process the choice? Cognitive impairment is approximately equivalent to mild dementia. Dementia is defined by DSM IV as chronic impairment in two or more cognitive domains (executive function, aphasia, apraxia, agnosia) that substantially affects daily functioning. It must represent decline in premorbid function and not be due to acute delirium. Cognitive impairment (CI) is underrecognized by the dialysis community in general. There are several studies (REGARDS study, Murray et al, CHS Study) that show high prevalence of CI in CKD and dialysis. Rakowski et al demonstrated that dialysis patients with dementia/CI had decreased 2-year survival on dialysis (P<0.001). From a sample of 338 dialysis patients nearly 70% of patients had moderate to severe degrees of CI. Despite these staggering numbers, only 3% had a documented history of CI. There is no “gold standard” for the diagnosis of CI in dialysis patients. To give an example – in a recent systematic review and meta-analysis by O’Lone et al from Australia,­­­­­­­­­­­­­­­­­­­­­ 54 different tests were used in the 42 studies that were included in the systematic review! The most commonly used tests are:. Often these studies are of modest size but more concerning is that they have exclusion criteria that limit the applicability to the general dialysis population. In a recent study by Neuman et al, nearly half of eligible patients were excluded from cognitive testing because of visual, motivational, or motor difficulties. They concluded that cognitive testing could be improved by further testing using non-visual and nonverbal testing to better characterize the entire at-risk population. Cognitive impairment can be vascular or nonvascular in nature. And cognitive dysfunction can be both acute and chronic. The risk factors for dementia in the general population: advanced age, diabetes, hypertension, dyslipidemia, stroke, anemia, inflammation, poor diet, and lack of exercise are all commonly found in CKD patients. In addition, CKD patients are at high risk for future vascular events. Together this drives up the incidence of vascular dementia. Additionally, patients on dialysis have increased microinfarcts and white matter changes which likely contributory to CI. Most individuals with CKD are also at risk of accelerated decline in cognitive function due to specific factors inherent to renal failure, including anemia and uremia. 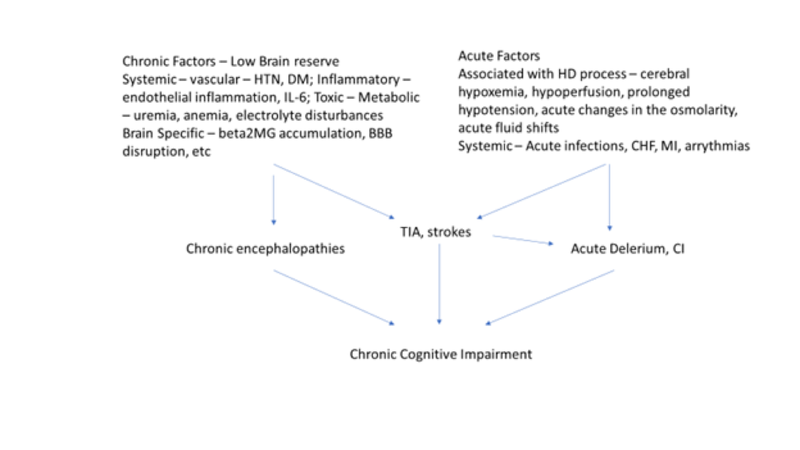 The process of dialysis itself may contribute to a worsening of CI, either by causing large, rapid shifts in fluid and urea (dialysis disequilibrium) or by causing intradialytic cerebral hypoperfusion and hypoxia associated with changes in circulating volume. Overall as shown in the figure below, it is obvious that cognitive impairment in CKD is multifactorial and complex. Adapted from Murray AM, ACKD, © National Kidney Foundation. Koushik et al in an older review presented a review of cognitive testing in all stages of CKD. HD and PD patients both showed poorer cognitive function when compared to the general population. Measurement of cognitive function in HD patients is complicated by timing. Most tests showed better results when testing was done after HD sessions (best on the day after) with the worst results right before HD. PD patients did not have such fluctuations. In another study, the testing CKD5 patients not on dialysis (either awaiting a start or on conservative care) had poorer cognitive status than similar patients on dialysis. If we do not realize or accept that something is broken then there is no incentive to fix it. Cognitive impairment is not new, but it is an area that is now increasingly being recognized as being an important problem. Once we accept that our CKD/HD patients have significant CI, we can design better studies to identify the causes and further methods to prevent, delay, or even treat this. This area is often neglected and needs to be brought into sharp focus. Cognitive function directly affects our patients’ quality of life and decision making ability, limits their ability to cope with a debilitating chronic disease, is a constant source of anxiety, and ultimately affects their survival. We need to put the patient first and recognizing cognitive dysfunction is a start in the right direction. Treatment of end-stage renal disease has evolved over the last 50 years and more from being a lifesaving therapy for acute kidney injury to a maintenance therapy for patients with ESKD. Despite advances in HD, outcomes are not ideal. Using a reductionist model to improve outcomes has resulted in nephrologists working to improve a host of surrogate outcomes, hemoglobin, phosphorus, albumin, Kt/V, etc. Many (most? all?) of which have not been validated to improve dialysis outcomes. Not only are doctors desperately chasing after unvalidated outcomes, they are doing this instead of pursuing outcomes that patients care about. Patients with CKD prioritize quality of life, mental health, impact on family, fatigue, and employment. These are outcomes are rarely considered in dialysis research: when evaluating a therapy that may affect an unvalidated outcome, we don’t even get the data on how it affects the outcomes patients care about. Figure 1 from Urquhart-Secord et al, AJKD, © National Kidney Foundation. Mean rank scores for outcomes identified in at least 4 groups. ∗Resilience/coping was originally termed “survival” by patients/caregivers but has been re-termed for clarity of definition; washed out and drained was defined as “feeling sick, drained, tired after dialysis or recovery time after a dialysis session,” and fatigue/energy was defined as “feeling tired and without energy for most of the time”; cardiovascular disease included any disease of the heart and blood vessels (eg, heart attack, stroke, blockage of blood vessels). Look at the disparity in mortality and ability to work between caregivers and patients. Patients want to live well. They want to improve day-to-day functioning, be gainfully employed, they want to feel awake in the morning – not wasted. They want to travel and “be normal”. The other aspect of outcomes that became very obvious was that patients want their immediate issues to be dealt with rather than worry about potential long-term outcomes. Patients rate immediacy of their symptoms more highly than the intangible biochemical outcomes. Especially when in an effort to improve the numbers, physicians change the dialysis prescription. Patients struggle with loss of autonomy. Patients feel a tangible loss of quality of life in order to gain an intangible improvement to a number. Engaging all stakeholders in establishing a core outcome set, an agreed minimum set of standardized outcomes to be measured and reported in all trials for a particular clinical area, can increase the relevance, efficiency, and reliability of trials. The first step for SONG was establishing a core set of outcomes. This was done with a Delphi survey (invented by the RAND corporation in the 50s) a validated approach to developing consensus-based core outcomes for clinical trials in various medical specialty areas. Mean rank scores for outcomes identified in at least 4 groups. ∗See previous figure above. Of note, dialysis adequacy was highly rated by patients and caregivers. On discussion it became apparent that “dialysis adequacy” was interpreted as a broad quality-of-life outcome (ie, dialysis that is adequate for enabling patients to feel well) rather than quantification of urea kinetics. Doctors need research to improve the health and wellbeing of patients and every research study requires an outcome to measure. Too often these outcomes have been selected by physicians and were not relevant to patients. The coordinated and cooperative efforts of SONG-HD to generate consensus outcomes will enable studies to be comparable and more meaningful for people on both ends of the dialysis needle. – Post written and edited by Nikhil Shah (@dr_nikhilshah).